Last week I posted a review of Chōhei Kambayashi’s award-winning novel Good Luck, Yukikaze. Because I had enjoyed Yukikaze, the first novel in the series, I was looking forward to reading its sequel. Sadly, although there is some tremendously thought-provoking material in Good Luck, Yukikaze, I found it to be incredibly frustrating as a novel. Also posted last week was my first (and what will probably be my most substantial) contribution to the Female Goth Mangaka Carnival: a spotlight on Mitsukazu Mihara. I’ve previously written a little about her manga series The Embalmer, but this time I took a brief look at all of her manga that was released in English and examined some of the recurring themes found in her work. Speaking of the Carnival, the hosts at The Beautiful World posted an excellent introduction which includes biographical information of the featured artists as well as an overview of gothic fashion and literary themes. Elsewhere online, Mangabrog has translated a conversation between Hiroaki Samura and Masashi Kishimoto. Chromatic Press has some additional comments on making Sparkler Monthly back issues free to read. (Most importantly, the magazine needs 1,000 subscribers by the end of July 2015 to ensure it survives into its third year.) And some great news from France, Jiro Taniguchi and Baku Yumemakura’s manga series The Summit of the Gods (a favorite of mine) is being adapted as an animated film. Corto Maltese: Under the Sign of Capricorn by Hugo Pratt. A portion of Corto Maltese, a seminal comic created by Italian artist Hugo Pratt in 1967, was previously translated into English, however that release was criticized for its use of altered and reformatted page layouts among other things. 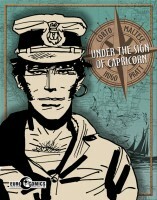 Under the Sign of Capricorn is technically the third Corto Maltese collection, but it’s the first volume to be released in the series’ new English-language edition from EuroComics, IDW’s newest imprint. The goal is to release the entire twelve-volume series using the original artwork and oversized format over the next few years. Under the Sign of Capricorn is a great looking comic, the high-quality paper and large trim size shows off Pratt’s superb black and white artwork. The titular Corto Maltese is a sea-captain who, though he claims to have no enemies and to live only for himself, frequently finds his life in danger as he tends to side with the underdogs in their battles against those who hold power over them. (He’s a fantastic character.) Under the Sign of Capricorn is a collection of connected adventure stories, many with a slight touch of the supernatural and a lot more humor than I was anticipating. I’m looking forward to reading more of the series. Noragami: Stray God, Volumes 2-3 by Adachitoka. It took a little while for the first volume of Noragami to settle on its tone, but these two volumes have managed to achieve an excellent balance between the series’ humor and drama. They also explore more of the manga’s worldbuilding and delve more deeply into the mechanics of the gods’ relationships with their shinki. New characters and adversaries have been introduced as well. I initially thought that Noragami might be an episodic series—it certainly has a setup that would lend itself well to that format—but it looks like the manga will have an ongoing and increasingly complex plot. In a series about a low-level god of war who is trying to raise his status and gain followers, it’s not too surprising that other Japanese deities make an appearance in Noragami. However, some of them are portrayed very differently than their traditional counterparts. I was greatly amused by this, but then I already have some knowledge of Japanese religion and mythology. There are translation notes provided for readers who aren’t as familiar, but the delightful incongruities probably won’t be as effective without some prior understanding. However, overall enjoyment of Noragami doesn’t rely on esoteric expertise. Tough Love Baby by Shiuko Kano. While it’s not an exceptional boys’ love one-shot, Tough Love Baby was actually fairly solid. This was a pleasant surprise, especially considering my frustrations with some of Kano’s other early works. (And Tough Love Baby is one of her earliest.) Another pleasant surprise—since I’m into that sort of thing—was the somewhat reversible nature of two of the characters. Despite being the secondary couple, I was actually much more interested in the relationship between Tamotsu and Sora than I was in the relationship between Yoshino and Sachi. This was mostly because I ended up particularly liking Sora. (Tamotsu can be a bit of a jerk, though on occasion he does try not to be.) Sora is diminutive throughout high school, but undergoes a tremendous growth spurt upon entering college. Even though he’s much taller than everyone one else, adorable is still the best word to describe him. In some ways, Sora’s story actually parallels Sachi’s. After a three-year absence, Yoshino returns to discover that the cute thirteen-year-old boy he had developed feelings for has grown up to become a juvenile delinquent. Tamotsu is one of Sachi’s friends and a fellow tough guy, but he happens to be in love with Sachi, too. Which brings the story back to Sora, who greatly admires and falls for Tamotsu.